Make your next Halloween party or haunted house an event to remember! 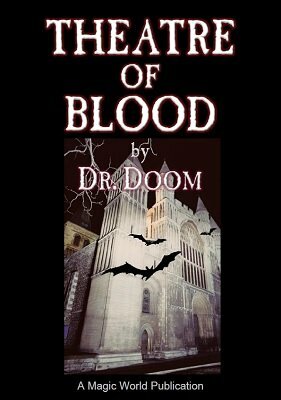 Dr. Doom reveals secrets of his Theatre of Blood professional haunted house attraction. Illusions, effects, costuming, makeup, sound effects and more are discussed. Everything you need for a successful and scary house of horrors. Newly revised, with nearly 20 pages of new content, including new sections on merchandising, new scenes and attractions and more. A great compliment to Nelson's Ghost Book of Dark Secrets , Theatre of Blood is a must-have addition to your spook magic library. 1st edition ~1970, 76 pages.